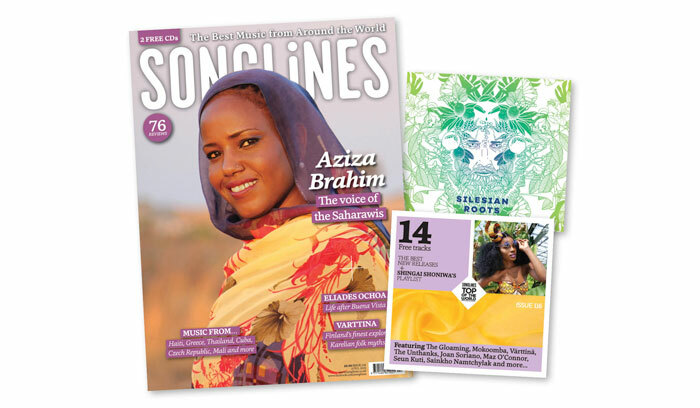 Leading world music UK magazine Songlines featured Saharawi singer and percussionist Aziza Brahim on the cover of their April 2016 issue. Inside, they included a featured article about Aziza in the run-up to the release of her third album Abbar el-Hamada. The article talks about Aziza's career as a singer-activist, her musical influences - including traditional Saharawi music - and her close relationship with her poetess grandmother Lkhadra Mabrouk. ​Film & edit by Katch Holmes, Alan Gignoux. Saharawi music is rooted in the tradition of Trab El-Bidhân and is closely related to the music played in Mauritania, known as el-hawl. This musical style is made up by a complex system of modes known as bhor (seas) that sing of different themes such as love, religious praise, battle, homage to landscapes, and nostalgia. These modes are traditionally played in a strict and specific order. ​In Mauritania, el-hawl is usually played by the iggâwen (griots), the hereditary praisers and story-tellers, who have been regarded as socially inferior. Although admired for their talents, they were looked upon for earning their living from music and praising. Traditionally, the iggâwen (iggiw in singular) played at the service of eminent social personalities and political leaders often developing entire repertoires in their praise. They also played at key social events related to the celebration of birth, marriage and even divorce. The central social pastime of drinking tea in Bidhân society equally provided an inspiring and informal setting for el-hawl to be played. ​Unlike the Mauritanian society, however, the Saharawis never developed a griot social group dedicated to playing music. In the Saharawi context, music was primarily a communal activity and a popular expression closely connected to women and the poetry tradition. The main instrument played was the t’bal drum, accompanied by clapping and singing. The Saharawis excelled in the rich spiritual tradition of medh. The tidinit, a four-stringed lute, and the aardeen, a calabash harp, played by the Mauritanian male and female iggiw, respectively, were rarely played or mastered by the Saharawis. Saharawi music bands and professional musicians began to appear in the early 70s at the end of the Spanish colonialism. Over the past four decades, particularly in the diaspora and especially in the refugee camps, Saharawi music has evolved to reflect the centrality of their cause and the influences of modern instruments. The most famous Saharawi modern revolutionary band of all time has been Shaheed El Uali, named after Polisario founder El Uali Mustapha Sayed. The electric guitar, bass and keyboard synthesizer, in particular, have tended to be preferred over the traditional tidinit and the t’bal drum. Musical modes relating to battle and landscape have developed at the expense of other modes. Due to multiple influences, the younger generation of Saharawis are increasingly experimenting with and incorporating other music traditions into theirs, especially from the Latin American and hip-hop worlds. Most significantly, the Saharawis have largely succeeded in overcoming the social stigma associated with being a musician. This has been possible because those Saharawis with talent applied it to sing for their cause and not for money, in the early days, thereby making it an acceptable and even noble pursuit. Today, Saharawi artists are increasingly looking to earn a livelihood through their music. Playing at weddings in the refugee camps is currently one of the most lucrative activities. For the time being those wishing to become professional musicians have had to go abroad to develop their careers, such as Mariem Hassan and Aziza Brahim. DO YOU WANT TO LEARN MORE ABOUT Saharawi music? & browse through Violeta Ruano's collection "Portraits of Saharawi Music". on the journal Transmodernity, by Violeta Ruano & Vivian Solana.